Strawberry plants and borage have a special relationship. Many books have been written on companion planting; and strawberry plants, like most other plants, can benefit from being planted in close proximity to other flora. The most beneficial plant to plant in close proximity to strawberry plants is likely the culinary herb borage. But before delving into the relationship between strawberry plants and borage, a brief bit of background information may be helpful. Do Strawberry Plants Need Companion Plants? At its heart, all companion planting is based on the theory (backed by significant evidence) that planting different plant species in close proximity can, in the right combinations, produce mutually beneficial and even synergistic results. Many combinations have been discovered and shown to positively influence nutrient uptake, aid in controlling harmful pests, and increase pollination (among others). Each synergistic improvement tends to yield benefits in the health and productivity of the crop. So, do strawberry plants need companions? The answer depends upon who is asking. If you are a commercial operation, strawberry plants don’t need companion planting. The commercial strawberry plants (and consequently the strawberries) are usually doused with pesticides and petroleum-derived fertilizers (see: 10 Reasons to Grow Your Own Strawberries). Plus, planting anything other than strawberries on a commercial strawberry farm may decrease the overall yield derived from modern farming practices. But, if you are a home gardener planting strawberry plants alongside borage can make a lot of sense. Organic and sustainable agricultural practices are pushing their way into the mainstream, and this is a good thing. So, if strawberry plants are in your garden (or will be), and you don’t want to be completely dependent on toxic pesticides or non-organic fertilizers, companion planting is a good idea. The herb borage (Borago officinalis) is known primarily as a culinary herb, but it has other benefits as a companion plant when planted with strawberry plants. Borage is widely accepted as one of the best companion plants for its observed effects within a garden. And, it has a specific affinity when planted alongside strawberry plants. As discussed on the Strawberry Plant page, strawberry plants and strawberries have numerous pests and pathogens that can kill or maim them. Planting borage next to strawberry plants serves several beneficial functions for the strawberry plants. Namely, the borage plants tend to deter many of the insect pests that afflict strawberry plant. Additionally, they are a powerful pollinator attractor and can make pollination more robust (useful in developing new strawberry varieties). With the attraction of pollinators, the borage plants also bring other helpful defenders of strawberry plants: predatory insects. Praying mantis and predatory wasps are frequently drawn to gardens where borage is planted (along with others). Predatory insects cannibalize other insects that would do damage to strawberry plants, given the chance. Perhaps the biggest benefit of planting strawberries with borage, however, is that the flavor profile of the strawberries themselves is improved. Of course, taste is a subjective thing, but most gardeners who have started planting strawberry plants with borage note flavor improvement. And, while borage won’t work in the same way as heavy doses of fertilizer and pesticides, it does positively impact strawberry yield. It is also believed that borage plants increase the level of trace minerals in the soil in which they are planted making the strawberries planted near them even more beneficial for health! Borage plants do not need to be alternated with strawberry plants in order to provide mutually beneficial results. In fact, lots of them aren’t required. If June-bearing strawberries are planted in the matted row system (see the Growing Strawberries page for details), one borage plant every 3 to 4 feet in the center of the matted row should be sufficient. Of course, feel free to experiment and determine the best spacing and location for your given climate, soil, and strawberry variety. If borage plants are planted, they will attract many pollinators. These pollinators will help fertilize many of the plants in a garden. Plus, bees absolutely love borage and make a delicious honey from its nectar. If you happen to be a beekeeper as well as a gardener, keep this in mind! Borage is also edible itself. Its leaves have a mild cucumber taste and the flowers are also edible and lightly sweet as well. The leaves can be used in salads or drinks and as a garnish for summer desserts. They can also be prepared and eaten in the same fashion as spinach. When it comes to planting borage with your strawberry plants, adopt Nike’s old slogan: Just Do It! It will benefit your strawberries, benefit your other garden plants, and benefit your health as well. Plus, the borage plant itself is a fantastic example of unique beauty. You can buy borage seeds from Amazon.com. I generally grow my strawberries in troughs as my section is very small. I would really like to plant borage with my strawberries but I’m a little concerned that if I do there will be so many bees and wasps (that may or may not be aggressive/territorial) that I wont be able to get to my strawberries to pick them. Have you experienced this? Also I may have a solution for slugs. I have heard recently that slugs do not like sharp pointy things so if you place bits of eggshell or broken charcoal around your plants the slugs will stay away. Another solution my mom heard of years ago was that if you place a cup of beer in the soil, the slugs will be attracted to the sugars in the beer and will go to the cup fall in and die (sorry slugs!) instead of going to your strawberries. And obviously you don’t want to fill the cup up all the way, filling the cup 1/4 full should be enough. I will be trying some of these tricks out this year to see if they work! Well put. I guess technically you are mostly correct, although some species of insects are truly cannibalistic, most aren’t. Some wasps and ants eat other wasps and ants, but most stick to munching on the “other fellow.” Thanks for the comment! 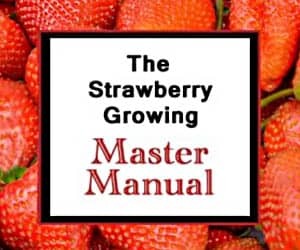 If your strawberries are soft and mushy they may be getting too much water. I would imagine they would do just as well as companions in strawberry pots? Yes, indeed, as long as the pots are big enough! Good luck! My s/o bought some Blue Borago seeds at the beginning of this year, because they are pollinator attractors. It was in doing research on my strawberries before I planted them that I discovered that borage & strawberries are great companion plants. The strawberry plants that are in the same garden box as the borage have grown beautifully & have tonnes of flowers & berries growing now. I’ve definitely learned that 1-2 borage plants per 6-foot garden box is PLENTY. They grow fast & huge. I am so impressed with how many bees I have seen on this plant, as well as how well my strawberries are doing with it, so I’m HOOKED. Thanks for the feedback! I’m glad your strawberries are flourishing! i have grown borage with my strawberries each year. i grow day-neutrals and june-bearers. the borage can get overly large…it uses lots of space and needs to be staked to prevent it from falling over. yes, the honeybees flock to it. but once you plant borage and let the flowers form seeds, you will have volunteer borage plants forevermore. i have tried transplanting the borage, using the flowers in salads, and have dried the young leaves for tea. i have had no pests on my strawberries except for slugs…this year i will pull out all the stops against those slimy monsters…sluggo and beer traps. Whats the best placement for borage and strawberries (june bearing). 60-40 borage to strawberries? Space the plants about a foot apart. Good luck! My strawberries look ready to pick and look beautiful but are either completely soft or totally mushy when we grab them. I can’t figure out what is going on. Any suggestions. We are in Renton, WA.Idon’t think it’s mold because the ones hanging over the edge have the same problem. You might be leaving them on the plant a bit too long. They will get soft and mushy when overripe. Also, some varieties are more firm than others when ripe. Your variety may be predisposed to being somewhat squishy. Try picking them a bit earlier or switching to a firmer variety. Good luck! Does anyone know if borage needs to be in the same soil as the strawberry plants in order to enhance their flavor or can it be grown in a planter nearby? It is best to have the borage planted in the same area as the strawberries, with contiguous soil. Good luck! Thanks for stopping by! A fairly easy remedy would be to take a few of the Strawberry Runners, dig them up, and Transplant them amongst the borage. You can even do an experiment and see how much better the strawberry plants among the borage do than the ones on the other end of the garden. This is extremely interesting and helpful. I’m definitely going to try it. Thank you!